What an amazing weekend I just had! I had to pinch myself a few times to make sure I wasn’t dreaming because the 2014 Wine and Dine Half Marathon Weekend is one I won’t forget!!! Bonnet Creek is a family resort nestled about 2 miles away from Epcot. It has TONS of things to do on property. Including having a little trail that goes around the property in case you want to do a quick shake out run to release some of that pre race anxiety. No need to worry about parking! They offer transportation to and from the races! This is a major plus because you know you will be on time and get dropped off right where you need to go! And when you are done running and earned a couple notches on your awesome meter, they drop you off right in front of the resort! I know that some resorts have a special designated area for buses only, off to the side. Bonnet Creek is literally door to door service. When I finished running the Wine and Dine being dropped off at the entrance was a MAJOR plus! Bonnet Creek also offers carb loading pasta dinner for runners. A few options already prepared and SUPER delicious! My husband and I ate them and oh so yummy..and healthy! The waiters were VERY friendly and quick with service. Our waiter knew we were running the half marathon that night so he kept me stocked with water! I never had to ask for more, he had it ready. I know most of you will be traveling from out-of-state and are not too familiar with the area. 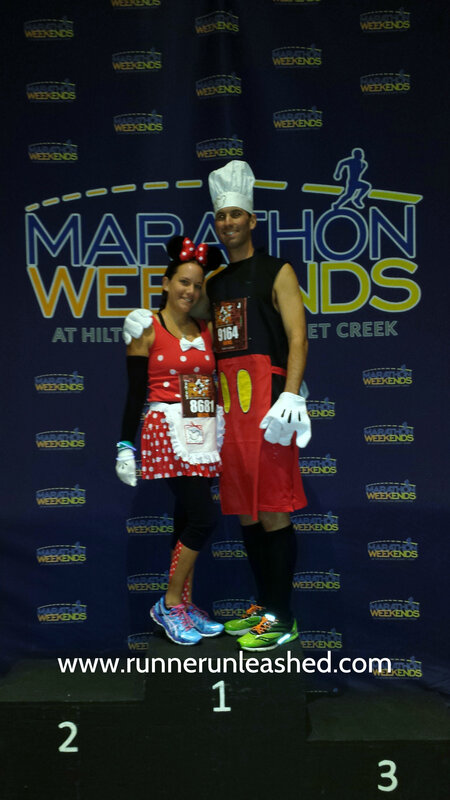 Bonnet Creek has you covered with where to go to eat, do running related activities, or book a massage post race. 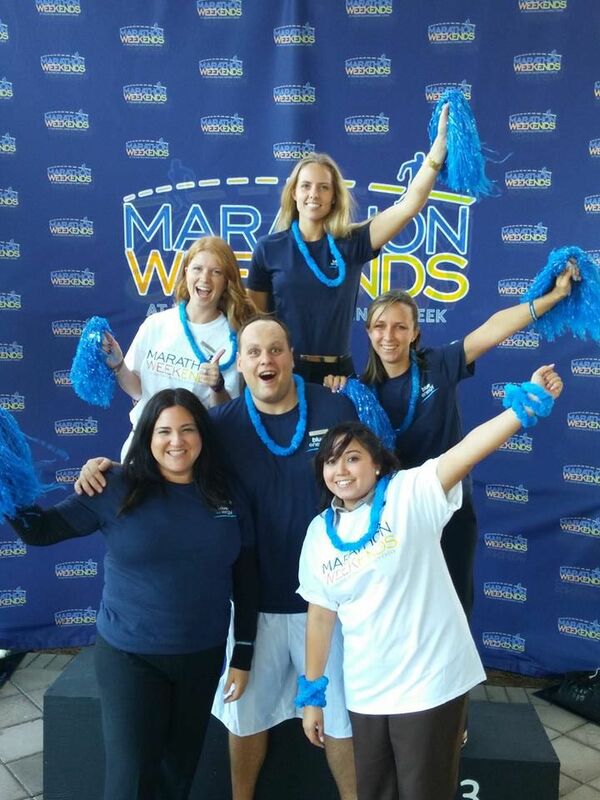 And guess what else comes with the Marathon Weekend runners package….a personalized assistance from the runner concierge!!! How awesome is that!?!?! It surely makes your stay a lot more relaxed when you have someone who will help you prepare and answer any questions you might have! 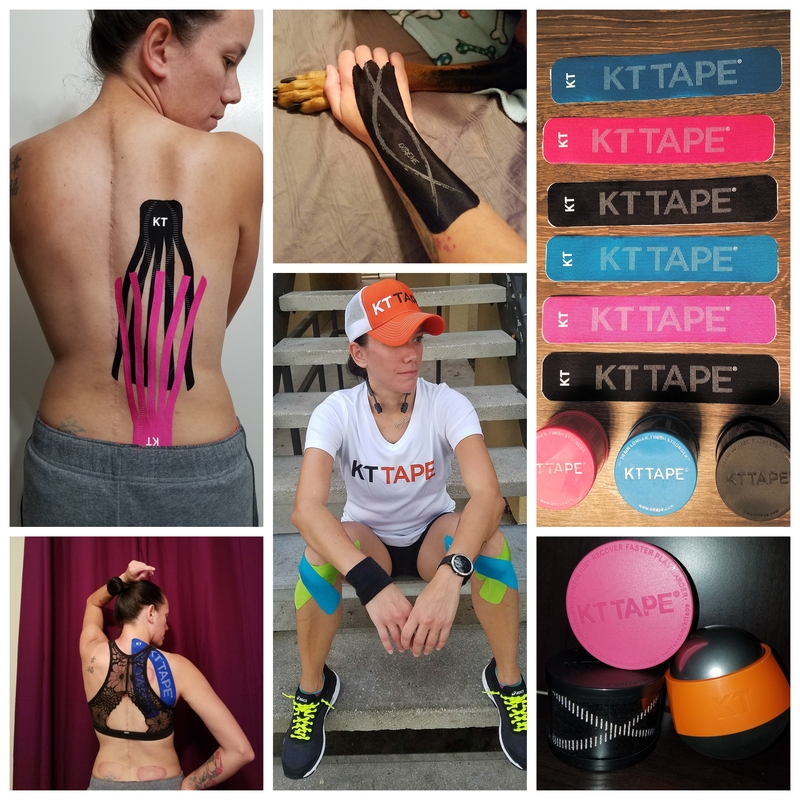 I know you runners know how helpful that is! 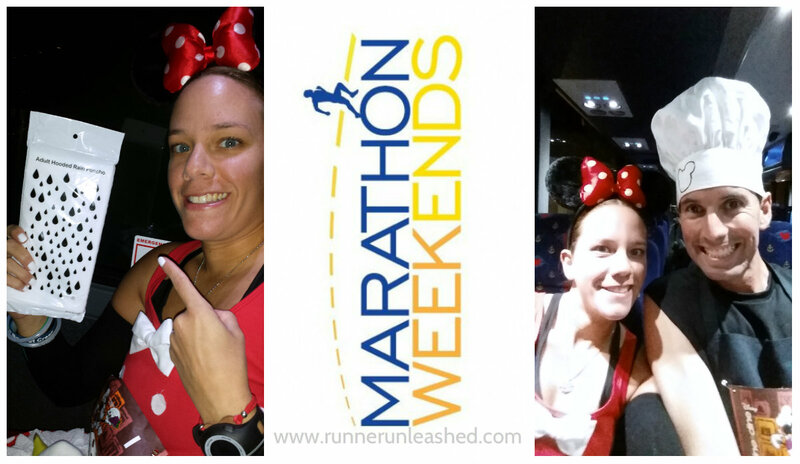 We certainly took advantage of that and the runner concierge team certainly did an amazing job. They answered my questions and even gave me a little welcome bag with runner goodies inside. They were also cheering for us as we left to go run the race! A very fun enthusiastic staff cheering for all the runners! And the bed…OMG! It was so fluffy and snug, that it was holding hostage most of the day!!! 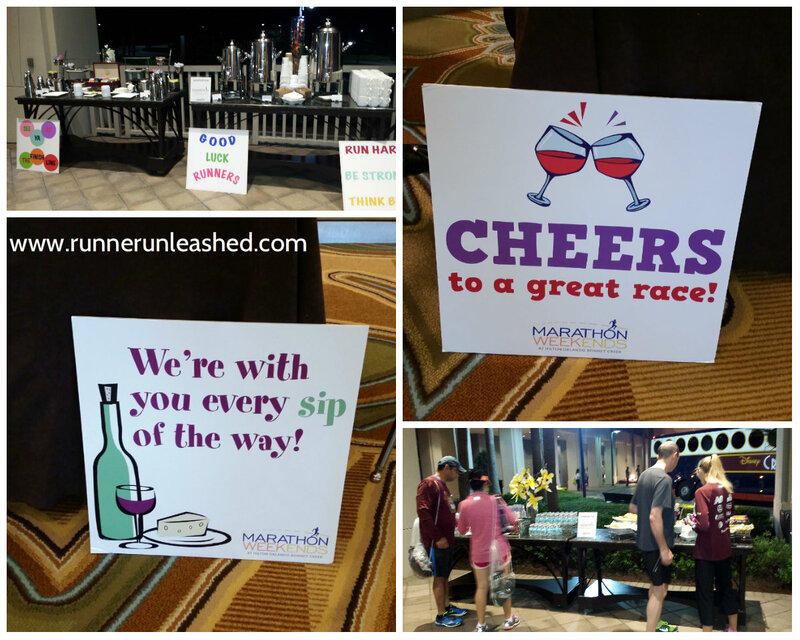 But beside the rooms being so comfortable, clean, and oh so cozy, the Marathon Weekends team definitely went all out for us runners staying there. Since the Wine and Dine Half Marathon race started at 10p.m. they made a special send off area for us! It included water, bananas, snacks, and a poncho!!! The poncho was especially important being that it was a very wet and rainy race. Most runners weren’t prepared for the rain but the Bonnet Creek staff was and made sure everyone would be as comfortable as they could be. On the bus..with a poncho in hand!! Staying here was truly a great experience and looking forward to returning in January for the Marathon Weekend. They have a beautiful resort with a lazy river and a pool. Lots of places for breakfast, lunch, and dinner. Anything you need, they will be there to help you. The staff was very helpful and even though it might not seem like much, the little details that they took care of made a difference. I know that for each race my nerves are all over the place, no matter how many times I’ve run it. Knowing that where I stay will take care of having food for my running needs, transportation, snacks, AND a send off party!?!??! What more can a runner ask for????? I strongly recommend staying at the Hilton Bonnet Creek for any future races you might have. They give you EVERYTHING you’ll need and more. I have stayed at other resorts in and around Walt Disney World, but no one takes care of their guests as Hilton Bonnet Creek does. It was a memorable experience staying at the Bonnet Creek. They certainly kept everything “running” no pun intended 😉 I was happy that I didn’t have to worry about many things making my stay more relaxing. They also give you a savings card that you can use throughout your stay at their resort. Lots of places to eat and enjoy your marathon weekend. 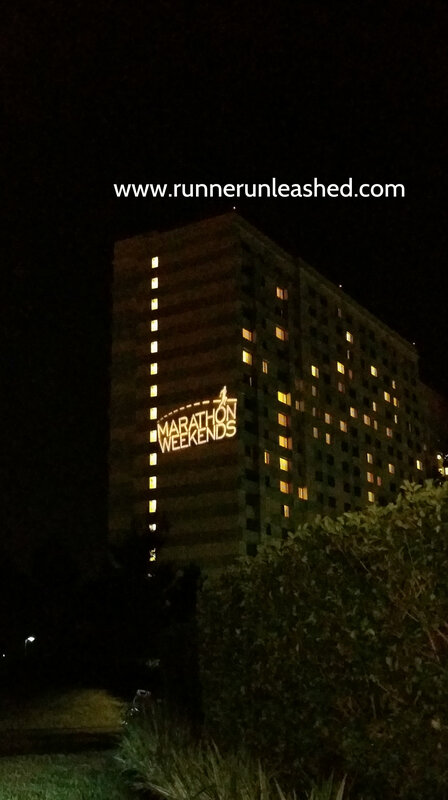 Click here to view their special marathon packages and other things they offer. All in all, my review for the Bonnet Creek was 5 stars! 2 Thumbs up! Way, way up!!!! I LOVE your outfits! So cute 🙂 Sounds like a great weekend and a great place to stay. Glad you had a great time!